Ethiopian Airlines will further strengthen itself in the nascent but rapidly growing Africa-Asia market by using its new Boeing 787 Dreamliners to open new routes – potentially in China, Malaysia and Singapore – reduce costs and align its overall fleet strategy to better serve existing Asian destinations. The geography of Ethiopian's hub in Addis Ababa allows the carrier to offer as efficient or more efficient connections than those through Middle East hubs. Ethiopian's African network is also unrivaled in the number of destinations served, and the booming times are seeing Ethiopian consider exercising 787 options and accelerating deliveries, slots permitting. Elsewhere in its route network, whose capacity is growing at 30% a year, Ethiopian next year will commence services to Toronto and in 2013 will increase capacity to Washington Dulles by deploying 777-300ERs. Ethiopian will become the first carrier in Africa and Europe to operate 787s when it takes the delivery of its first 787-8 in 2Q2012. The 787 this week is making its African debut, with a demonstration aircraft currently in Addis Abba to coincide with a ceremony celebrating Ethiopian joining the Star Alliance. Ethiopian had planned to first deploy its 787 – most previously expected in Jan-2012 – to Guangzhou, as CAPA reported in Jun-2011. Ethiopian CEO Tewolde Gebremariam told CAPA yesterday that Guangzhou is still an option for the carrier’s first 787 but Ethiopian is also now looking at using its first 787 to serve Hong Kong. He says Ethiopian is also evaluating three potential Asian routes which could be launched with the 787: Chongqing in China, Kuala Lumpur in Malaysia and Singapore. Guangzhou may not end up receiving Ethiopian's 787 on a regular basis because demand is now so strong from Guangzhou a larger aircraft is needed. Guangzhou had been served daily via Bangkok with 767-300ERs and the intention was to upgrade the route to non-stop once the first 787 was delivered. But Mr Gebremariam said Ethiopian decided to instead upgrade Guangzhou in Oct-2011 to non-stop using the 777-200LR, which seats 321 in two classes. Ethiopian's 767-300ER typically seats 234 while its 787-8 will seat 270 (24 in business and 246 in economy), giving the 777-200LR a 50 seat advantage – as well as greater cargo capacity, critical on the route to Guangzhou, China's manufacturing heartland. Mr Gebremariam says Guangzhou is switching back this week to the 767 via Bangkok but says demand is generally sufficient to support the 777-200LR. While Guangzhou could still see the 787 instead of the 777-200LR during certain times of the year, Mr Gebremariam foresees the 787 used more regularly to Hong Kong because Ethiopian has seen higher demand from mainland China than Hong Kong. Ethiopian now serves Hong Kong with four weekly 767-300ER flights via Bangkok. Mr Gebremariam says these will be upgraded to non-stop, likely in 2Q2012, after the first 787 is delivered. Mr Gebremariam says Ethiopian is now slated to receive four 787s in 2012 with the first to be delivered in the April to June timeframe. Ethiopian currently has 10 787s on order. All are for the -8 variant with the last aircraft slated for delivery in 2014. Mr. Gebremariam says the carrier is interested in exercising options for additional 787s and accelerating its deliveries, although 787 production slots are tight. Ethiopian, which also has orders for 12 A350s and nine additional 737-800s, needs more aircraft to meet its 15-year business plan. Mr Gebremariam says the 787 will enable Ethiopian to open new destinations while lowering its operating cost. “It is a pillar of our Vision 2025 [business plan],” he says. Ethiopian is particularly bullish on using its 787s to expand in Asia although the type will also be used on some European routes, likely starting by the end of 2012. Ethiopian now serves three destinations in mainland China – Guangzhou, Beijing and Hangzhou – and is planning to add several Chinese cities as part of Vision 2025, likely starting with Chongqing. While new destinations in Southeast Asia and North Asia are also part of Vision 2025, China is particularly the focal point as traffic between China and Africa is expected to boom. Ethiopian is particularly interested in Singapore. Mr Gebremariam acknowledges that Addis Ababa-Singapore is a small local market but sees potential for Singapore to become Ethiopian's Asian hub. Ethiopian Airlines and Singapore Airlines began a codeshare at the beginning of last month on the Addis Ababa-Dubai-Singapore route (with Ethiopian operating Addis Ababa-Dubai and Singapore operating Dubai-Singapore). This codeshare could potentially be expanded to include Singapore Airlines and SilkAir destinations in Southeast Asia as well as destinations in China, giving Ethiopian offline access to more of Asia. Singapore Changi is also keen to attract an East African carrier given the opportunities a Singapore-East Asia route could have in developing Singapore as a hub for broader Asia-Africa connections. Currently Changi only has one African carrier, Air Mauritius, and Singapore Airlines only serves one African country, South Africa, non-stop from Singapore (Cairo is served via Dubai). Rival hub Bangkok has been far more successful at developing African connections and has service from several African carriers including Ethiopian and Kenya Airways. While Ethiopian is also considering Kuala Lumpur, Singapore makes more sense as Singapore is a Star hub. Bangkok is also a Star hub but Ethiopian does not yet have a codeshare with Thai Airways. China is a key market for the carrier as Ethiopian is ideally positioned geographically to tap into the fast growing China-Africa market. Ethiopian currently operates 26 weekly flights to four destinations in China, making it the largest carrier between China and Africa. It has already begun codesharing with Star member Air China. Over the past decade air traffic between Africa and Asia has doubled. Africa supplies China with one-third of its fuel needs as well as notable amounts (by value) of timber, copper and diamonds, with trade between Africa and China surpassing USD100 billion in 2010. Of all traffic measured in revenue passenger kilometres to/from and within Asia-Pacific, Africa will have the highest annual growth rate at 8.4% through 2020, eclipsing the 7.5% of intra-Asia-Pacific traffic and 7.5% of Latin America-Asia-Pacific traffic, Airbus forecast in its 2011 market outlook. 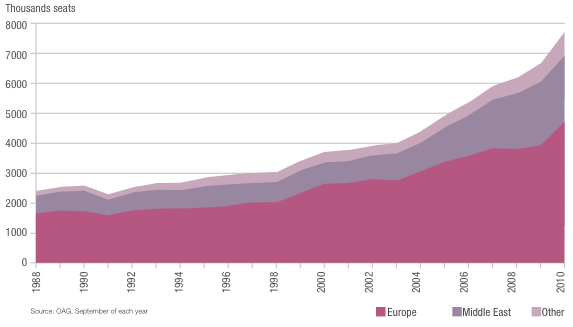 African travel will also eclipse the global average of traffic growth to/from and within Europe. RPKs from Africa will grow at 4.5% a year between 2011 and 2030, outpacing the 4.2% average, although Africa falls behind the Middle East, Russian Federation and Asia-Pacific. Africa will account for the second-highest growth of traffic to/from and within North America, growing at 5.6% a year from 2011 to 2030. While Africa's growth rates are high, the growth is based off currently low figures. Travel to/from/within Africa will be the single smallest region, representing just 3% of 2030's RPKs by Airbus estimates. Ethiopian's hub in Addis Ababa provides geographically convenient connections. On a sample routing from Shanghai to Johannesburg, transiting through Addis Ababa is only 21nm longer than transiting through Dubai. A routing from Guangzhou to Entebbe (Kampala) is 162nm shorter through Addis than Dubai. While intermediate point connection distances matter (as well as connection flight timing, which Emirates excels at with three departure banks) so too do the destinations served on the other end. Ethiopian serves 40 points in Africa compared to Kenya Airways' 44, Emirates' 21, Qatar's 14 and Etihad's 11. South African Airways, although not as strong a competitor for Asia-Africa services, has flights to 31 destinations in Africa. Boeing sales director for Africa Rob Faye told CAPA following a press briefing yesterday in Addis Abba that the 787 in Africa will be used more for route development than replacing existing aircraft, pointing out that Ethiopian and Kenya are both planning to double their overall fleets over the next 10 years. The 787 demonstrator will be stopping in Kenya later this week as part of its multi-month world tour. The 787 is geared as a 767 replacement, and Ethiopian's order of 10 787s corresponds to replacements for its 10 767-300s, but its comments to obtain additional frames support route growth. Likewise Kenya Airways has 5 767-300s in service and 9 787s on order. “Africa is going to grow. Aviation is the catalyst to growth,” Mr Faye says, adding that without connectivity economic growth is limited. Ethiopian is now unable to use its 767s to serve China non-stop because of the takeoff restrictions at Addis Abba, which has an altitude of over 7000ft. Hangzhou is served via Delhi and is another likely non-stop route for the 787. Ethiopian also previously served Beijing via Delhi but was able to upgrade its daily Beijing service to non-stop in May-2011 after taking delivery of its second batch of 777-200LRs. Mr. Gebremariam says Ethiopian plans to continue using 777-200LRs on the Addis Abba-Beijing route rather than switch to 787s as he expects the carrier would have some payload limitations with the 787 to Beijing. Mr Gebremariam says Ethiopian would likely have to leave a few seats empty flying the 787 out of Addis Abba for Beijing and would also be restricted in carrying belly cargo. Boeing, however, claims the 787-8 has the range to reach Beijing from Addis Abba, factoring in Addis Abba’s high altitude and normal 242-seat configuration. Ethiopian plans to operate its 787-8s with 246 seats in two-class configuration. Even if Beijing ends up being a borderline route for operating the 787-8 with full payload, all of Ethiopian’s other Asian routes and all its European routes are safely within range with full payload. As a result, Mr Gebremariam does not seem to upset with the aircraft coming in with less range than originally expected. Mr Gebrermariam says the range difference between the expected and actual range is very small with Beijing the only affected current route. He says Korea and Japan are also now out of range but while Korea and Japan are potential routes in the carrier's long-term business plan they are currently not high priorities. Ethiopian originally intended to use its 787s to serve the US via Europe but later decided to order five 777-200LRs to help offset the impact of the delivery delays on the 787. The first batch of two 777-200LR were delivered at the end of last year and used to upgrade Washington Dulles, which is now served non-stop on the eastbound leg. The last three 777-200LRs from Ethiopian’s order were delivered this year and used to upgrade Beijing and Guangzhou. Ethiopian also uses the 777-200LR on one of its two daily Dubai flights. Ethiopian was planning to begin flights this quarter to Toronto with 777-200LRs but postponed the launch of the new route. Mr Gebrermariam says Toronto is now planned to be launched in summer 2012 with two or three weekly 777-200LR flights. Like Washington DC, Toronto will be served non-stop on the eastbound leg but will stop in Rome going west. Ethiopian is continuing to study other potential new destinations in North America. But for now the carrier plans to focus on Washington Dulles and Toronto. Both are Star Alliance hubs which will help Ethiopian connect with the rest of North America. Ethiopian does not plan to acquire additional 777-200LRs but Mr Gebrermariam says the carrier has committed to acquiring two 777-300ERs for delivery in 2013. He says the intention is to use the 777-300ERs to up-gauge the Washington Dulles route. The 777-300ER has the range to be able to operate non-stop from Dulles to Addis Abba. Westbound a fuel stop will still be required but this is no disadvantage to the longer-range 777-200LR, which also needs a stop going west because of Addis Abba’s high altitude. Mr Gebrermariam says Ethiopian will keep its 777-200LRs even as the Dulles route switches over to 777-300ERs as it still has routes which are too thin for 777-300ERs and are too long for the 787. Overall Ethiopian is a flexible carrier and will likely change multiple times its deployment of aircraft. The main focus is rapid growth and to secure as many modern widebodies as possible. Mr Gebrermariam laments the 787s are still not coming fast enough, forcing the carrier to stick with some of its ageing 767-300ERs for longer than it wishes. He says Ethiopian this month returned one of its 767-300ERs, which leaves it with 10 of the type. But he said Ethiopian is unable to phase out any of its 767s in 2012 as it aims to continue growing capacity at a clip of 30% per year. Ethiopian, however, is phasing out three of its seven 757s in 1H2012. Mr Gebrermariam says the 757s will be replaced by a mix of additional 737s, 787s and 767s. Ethiopian is not increasing its 767 fleet but some 767s will be freed up to replace 757s on routes to Europe and within Africa as 787s replace 767s on Asian routes.